The Second Rutte cabinet, also called Rutte II cabinet or Rutte II, was a Dutch cabinet, which governed the Netherlands from November 5, 2012 to October 26, 2017 (demissionar from March 14, 2017). It consisted of the People's Party for Freedom and Democracy (VVD) and the Labor Party (PvdA). The Prime Minister was Mark Rutte (VVD), the Deputy Prime Minister Lodewijk Asscher (PvdA). Although Rutte II lost its small minority in the Second Chamber in November 2016, and had no minority in the First Chamber at all, it managed to fulfill its entire period. 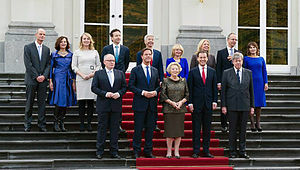 It has been succeeded by the Third Rutte cabinet. This page was last changed on 23 January 2018, at 15:59.